Our Dual Language classrooms contain roughly half English-native speakers and half Spanish-native speakers. This composition is referred to as a Two-Way Immersion classroom. 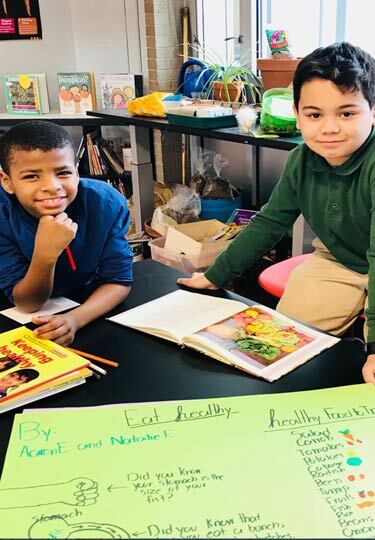 The societal and educational aim of our dual language classrooms is maintenance and enrichment of both languages, with bilingualism and biliteracy as the ultimate language aim. Bilingualism is the ability to proficiently speak and understand two languages. Biliteracy is the ability to proficiently read and write in two languages. Multiple research studies have shown that Two-Way Immersion education is highly effective for both English-dominant and Spanish-dominant students. Students eventually demonstrate high levels of proficiency in their second language and high academic achievement, without jeopardizing their English skills. It takes, on average, four to six years for a student to achieve bilingual proficiency. Two-Way Immersion works for English-dominant and Spanish-dominant studentsin an English-dominant society in different ways. For the Spanish-dominant student in an English-dominant society: a second language (English) is best learned when their first language (Spanish) is firmly established. By learning foundational literacy skills (e.g. letter sounds, syllables, and vocabulary) in their native language first, it provides the necessary linguistic foundation for adding English as a second language. For the English-dominant student in an English-dominant society: a second language (Spanish) is learned best through an environment that immerses them in the second language. This fosters communicative proficiency in Spanish while allowing them to naturally develop their English, thanks to the dominance of English in their social/cultural environment (e.g. home, grocery store, television, etc.). Therefore, for students in Two-Way Immersion classes, while Spanish-dominant students are taught primarily in their native language during the first few years of instruction, English-dominant students are immersed in their second language during these first few years. It is critically important for students of both Spanish- and English-dominant backgrounds to interact with one another in the Two-Way Immersion classroom. In this way, they become peer tutors and language models to one another, further solidifying the lessons by the teachers. Duration of instructional treatment: Programs should provide a minimum of four to six years of bilingual instruction to participating students. This is the amount of time required, on average, to reach second-language or bilingual proficiency. Think about this in terms of grade-levels. If your child began Two-Way Immersion in PK3 at Marie Reed, you should expect your child to be demonstrating bilingual proficiency by 3rd grade. Focus on academic curriculum: The focus of instruction should be on language acquisition as well as core academic material that students in other programs experience. Optimal language input and output: Input that is comprehensible, interesting, and of sufficient quantity as well as opportunities for output should be provided to students, including quality language arts instruction in both languages. Separation of languages for instruction: lessons should be instructed in one language at a time. The teacher should not mix the two languages within a given lesson. Ratio of English to Spanish Use: The target language (Spanish) should be used for instruction a minimum of 50 percent of the time (to a maximum of 90 percent in the early grades), and English should be used at least 10 percent of the time. The percentage of language instruction at Marie Reed is broken down as follows: a. PK3, PK4: 90% Spanish, 10% English b. Kindergarten: 80% Spanish, 20% English c. 1st-5th Grade: 50% Spanish, 50% English. Additive bilingual environment: The program should provide an additive bilingual environment where all students have the opportunity to learn a second language while continuing to develop their native language proficiency. Positive school environment: Positive interactions among students should be facilitated by the use of strategies such as cooperative learning. Classroom composition: Classrooms should include students from the target language (Spanish) and English backgrounds who participate in instructional activities together. Positive interdependence and reciprocal instructional climate: students, teachers, and families should interact positively in both languages and across ethnic/racial lines. Source: Lindholm, K., Bilingual immersion education: Criteria for program development, in Bilingual education: Issues and strategies (A. Padilla, H. Fairchild & C. Valadez, eds., Sage, 1990), pp. 91-105.